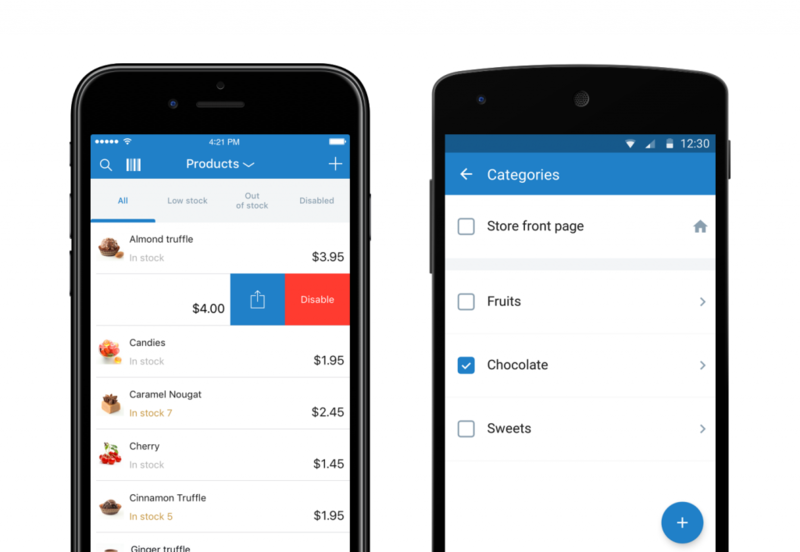 Hopefully, you’re already using the Ecwid mobile app to manage your store — it makes it so much easier to run an e-commerce business, and you only need a smartphone or a tablet to do so. 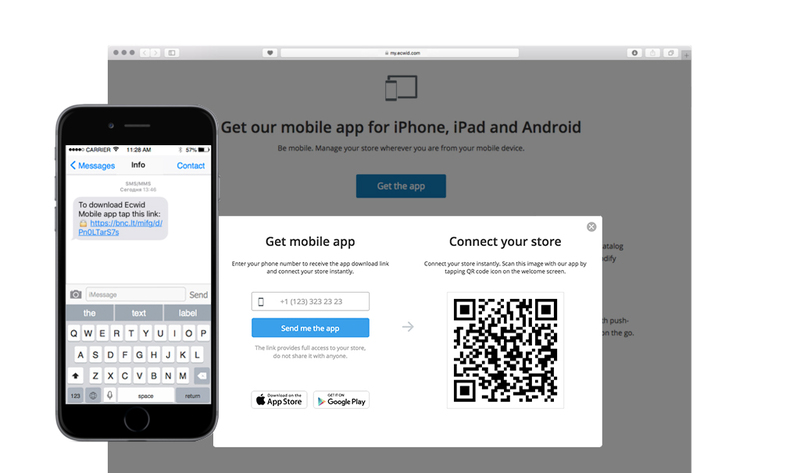 If you’re not hip to Ecwid’s mobile jibe, the good news for you is that it takes less time to connect a store or to create one with your iPhone or Android phone than it does to post a picture to Instagram. Read on to find out how Ecwid Mobile can enhance your business operations, whether you sell online, offline, or both. Click on Get Mobile App. Type your phone number into the dialogue that appears — you’ll get a text message that contains a custom link. Tap the link on your phone to go to the necessary App Market or Google Play page right away, where you can download the Ecwid app with one more tap. When you start your newly downloaded app, you’ll notice that it is already linked to your unique Ecwid store. The app is available for free on all Ecwid paid plans. Not a problem! You can create one via the app. To do so, download the app for iOS, and sign up with your email and password. You can use the app’s 14-day free trial to have a look around and evaluate its features. We’ll add this feature to the Android app very soon. After you’re done with the sign-up, you won’t have to enter your login/password every time you want to use the app. The app logs you in automatically, so there’s no email address and password situation here. Read on to learn how it works and download the app for Android or iPhone to try for yourselves. I’ve Installed the App. Now What? Manage your Ecwid store from your phone just as you would from your computer: check orders, change product descriptions, upload and sort new product pictures. It’s never been easier to manage your business, and now you can do it on the go. If you have an Ecwid online store, you can update your storefront with new products via your mobile phone. Let’s say you’re traveling when you learn that you’ve got new products in stock. Add them to your storefront on the go and start selling without losing precious time. If you don’t have an Ecwid online store, but sell in a physical location, you can upload your products to the app to manage them and keep the record of your sales — upload, edit, and update products and sort them into categories. Check out and edit your product variations right on the product details page in the app. Change product prices, pictures, and stock quantity. Upload your products to the app. Choose products from your list, specify sizes, colors, quantity needed. 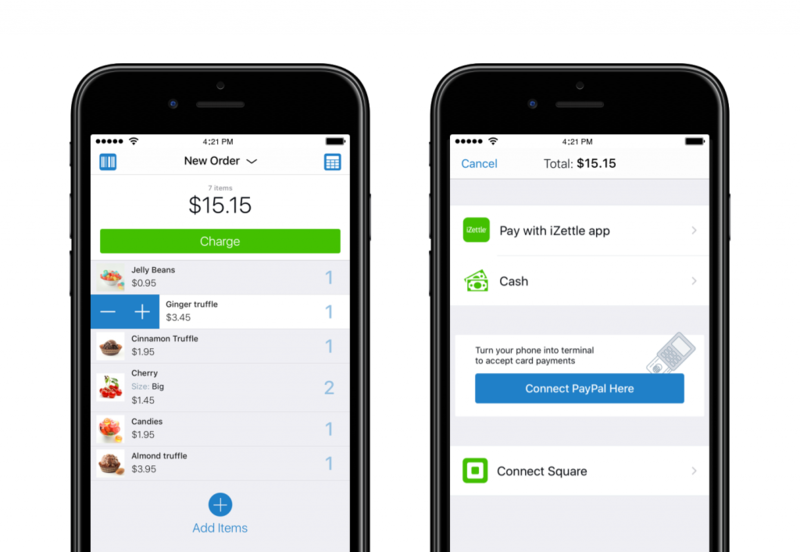 Tap Charge and choose one of the payment options: cash for both apps, or credit cards/Apple Pay for iOS. Learn more about accepting payments in Ecwid. In the early days of Amazon, company founder Jeff Bezos had a bell wired to ring every time someone made a purchase from his store. Nowadays, you can get a push notification. Checking your email all the time for new orders is not your job anymore. 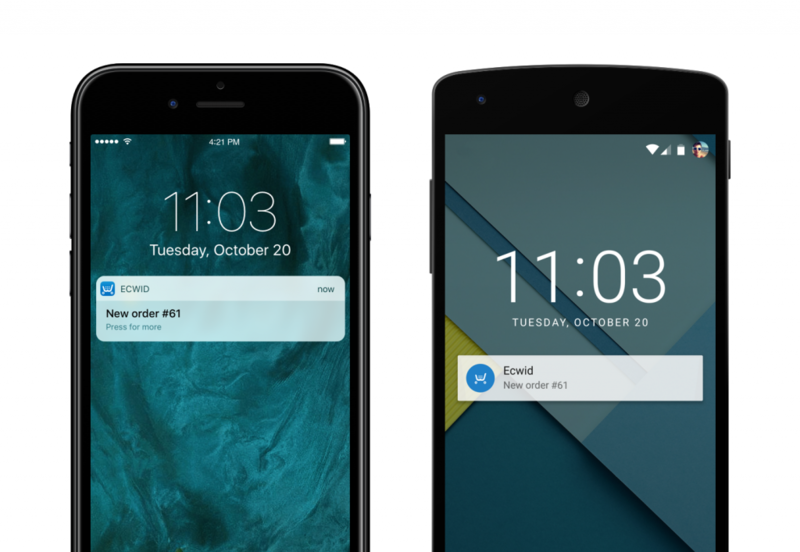 Now you can let notifications come to you no matter where you are, right on your smartphone or tablet. Using the camera on your tablet or smartphone, you can scan barcodes for fast access to details on your products or sales. This feature will be especially convenient for the users who operate a brick-and-mortar store in conjunction with their online presence. 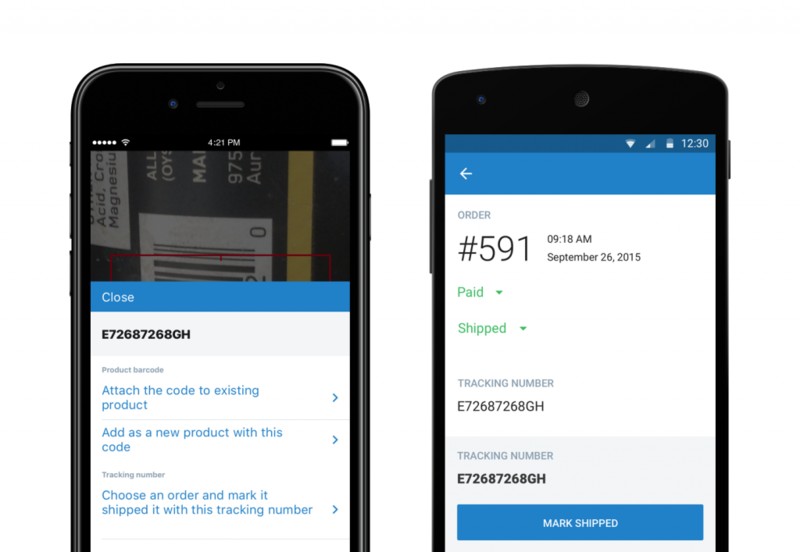 The camera can ease your shipping tasks too: use it to find an order by barcode (instead of typing in the tracking number) and mark an order as shipped. 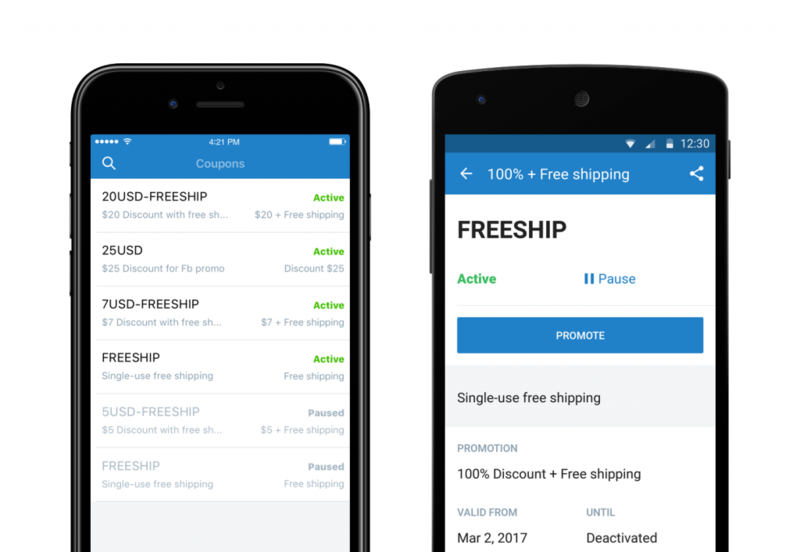 The app lets you generate, start, and pause different sorts of coupon codes for your online store with a few taps. Share your coupon codes with customers on social media and email within the app by tapping the blue Promote button. Set the amount of your discount in percent or your currency. Assign discounts to certain products, categories, or customers. Set minimum order subtotal for a discount to apply. Limit the number of purchases with a discount. Limit your promotions in time. Offer free shipping based on a certain subtotal minimum. Limit the offer to once per user, single use, or be generous enough to keep it unlimited. Provide free shipping for all customers or for repeat customers only. Combining discounts and free shipping is pretty brave for a store owner but super lucrative for shoppers. That’s why it’s very convenient to manage such promotions from your mobile phone. Start and stop this promo code when you need to. Say you’re in the room, packaging tens of your orders for shipping. How convenient would it be to have those invoices printed without running back and forth to your laptop? The same story goes for your popup store — you don’t have to bring a laptop to a market, fair, or any other crowded event. 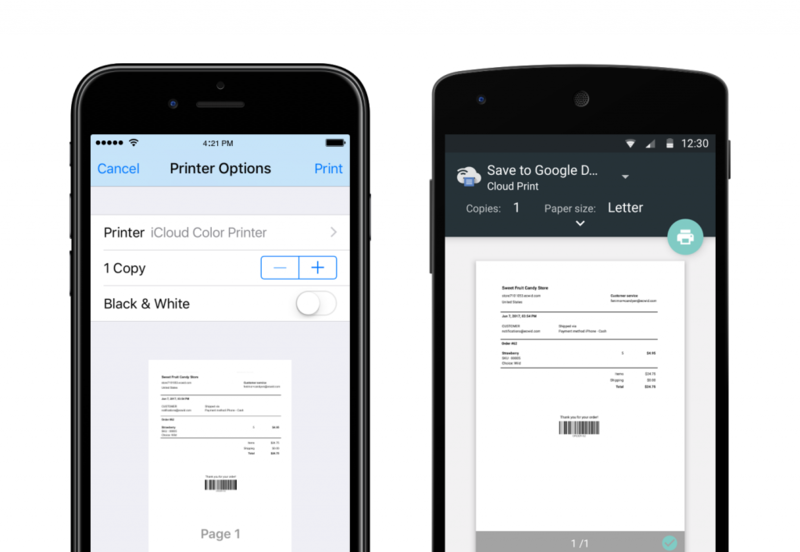 Create orders, get sales, and print invoices from your smartphone. Our customer care team will help you out with whatever they can. 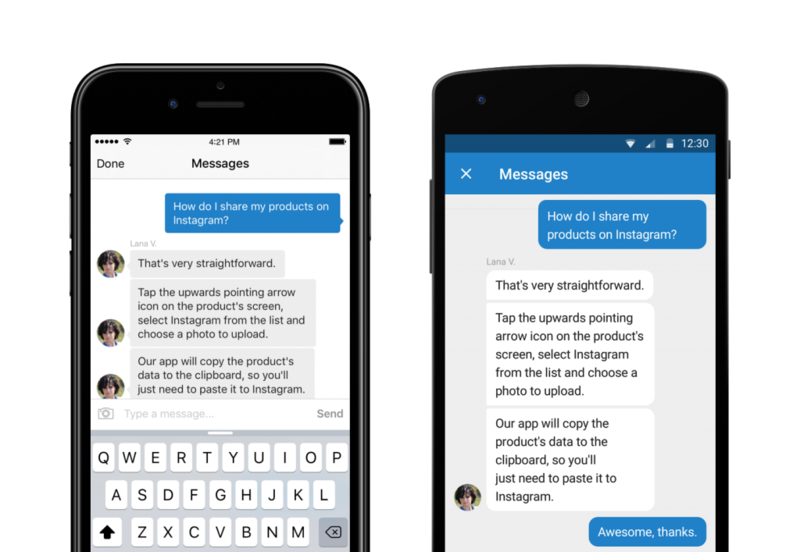 All you need to do is start a new chat with them in your Ecwid app. There’s no need to sit and wait for the reply — you’ll get a notification as soon they write back. Chats are only available to Ecwid Business or Unlimited plans, but our blog feed in the app is available for every Ecwid Mobile merchant. We regularly publish how-to posts on the use of Ecwid and all things e-commerce to help you grow big. 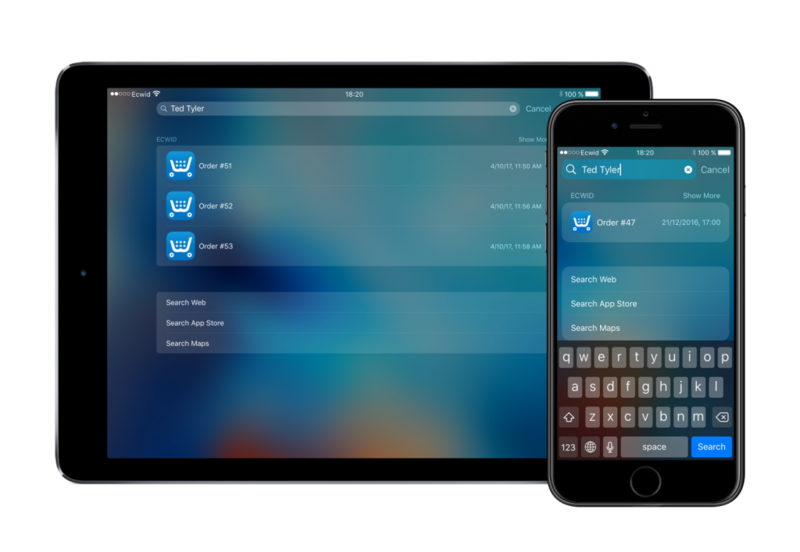 iPhone and iPad users can bring up Spotlight search by swiping down on their screens. Type what you’re looking for — order number, customer name, product name, etc. — and watch as your device returns the results to you without you even having to start the Ecwid app. The app for iOS supports homescreen widgets, which means you can get your sales stats right on your homescreen and look in even outside the app. Did you like what you’ve just learned? Don’t hesitate to download the Ecwid app for Android and iOS and see it in action! Once you’ve familiarized yourself with it, we want to hear what you think. Help us improve it by dropping us a line at mobile@ecwid.com. What’s that? You don’t have an online store up and running yet? You can get started right away by creating an account at Ecwid.com.